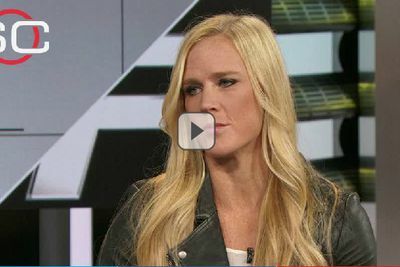 For as great an offensive performance Holly Holm exhibited at UFC 193 during her upset victory over Ronda Rousey in Melbourne, Australia (see it again here), her defense may have been just as brilliant. In fact, as Holm sees is it, defending “Rowdy’s” go-to moves such as her armbar and hip toss were instrumental in securing the bantamweight title-winning victory. As Holly recently revealed during her guest spot on ESPN’s SportsCenter, it was all part of her plan to frustrate Ronda.